When I was 18, I went to Europe – good move, I think – it altered my perceptions and changed my life – but I digress. 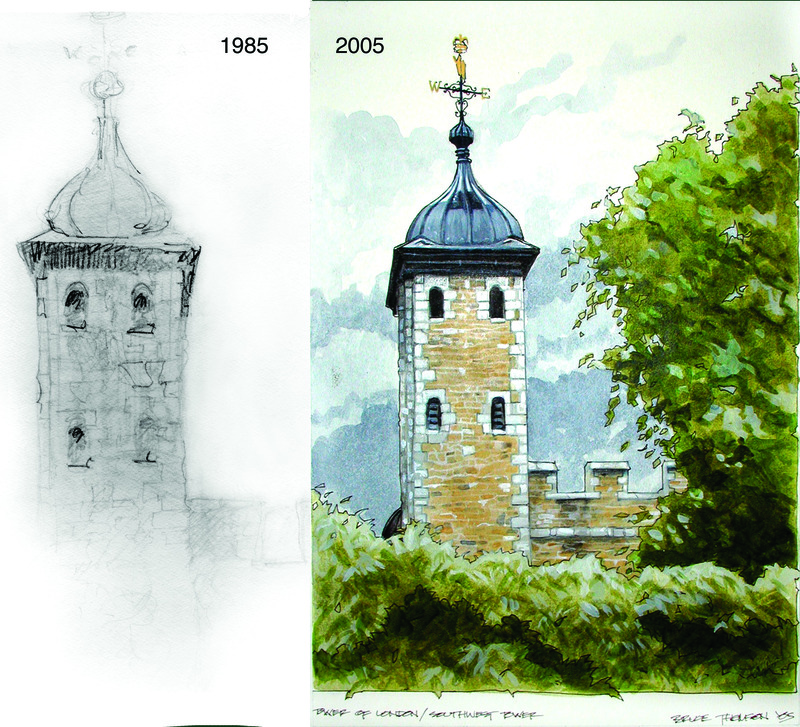 Even back then, I sketched… and on the left you see a badly aged sketch of the southwest tower of the Tower of London that I recently found in an old sketchbook which dates back to June of 1985 when I was a tender and innocent ( 😉 ) 18 years old. On the right is a sketch that I evolved into a loose painting in 2005, when I was living in London. When I did the second sketch/painting, I was completely unaware that I had done the one on the left… Almost the same viewpoint. I’m not sure if this testifies that monuments never change or artists don’t. Or maybe the best viewpoints are limited? Really the message here is; NEVER throw out your old sketchbooks. This entry was posted in Travel, Uncategorized and tagged Tower of London. Bookmark the permalink. 2 Responses to Old School and new. It might testify to something about your memory…or your drinking habits. I have always liked the London watercolors you did. Possibly time to pull out the easel and paints and do some more, perhaps even in the US or Canada.